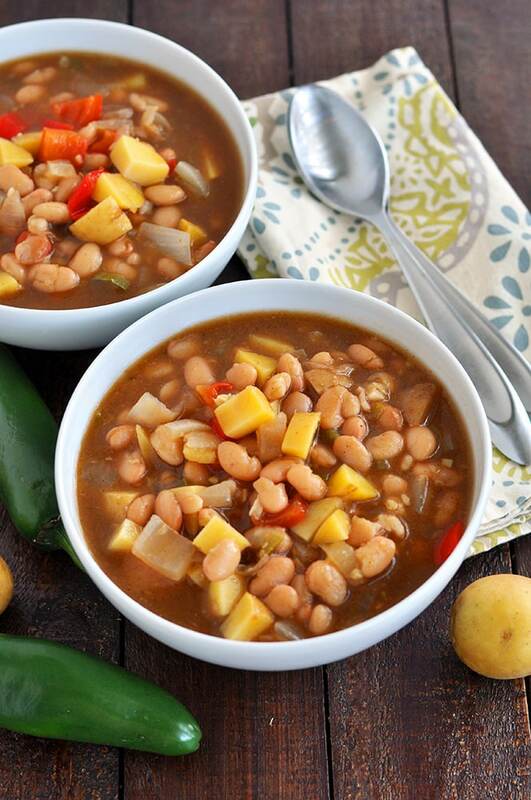 White Bean Chili. I have been wanting to do a slow cooker bean chili for quite some time. Problem is, I wasn’t sure how to make a white bean chili. So naturally, I ask my husband who is the chili expert in the house. I just love my crock pot . I try to make as many things in the crock pot as I can. Make this in the crock pot when you are not even home! Throw all the ingredients in the crock pot and cook it on high for about 6 hours. You can do less, but I feel like the more a soup cooks, the deeper the flavors develop. If you don't have a crock pot, you can also make this on the stove top in the same manner. However, I would not suggest doing it on the stove top when you are asleep or not home. Looks so yummy! Where did you get those bowls that are in the post? Love them. Thanks. Thanks Lauren! I just got them at Pier 1. Been looking forever for those! Looks yummy! 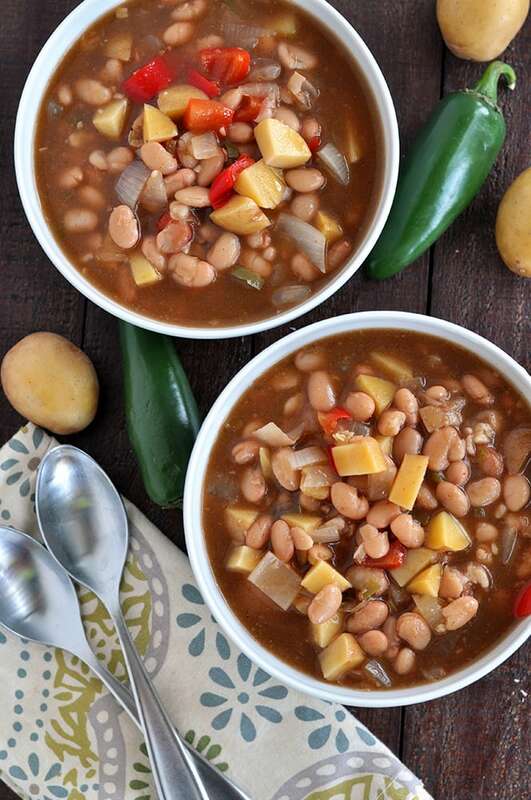 Want to try this tonight...do you drain the beans before adding them? Thank you! Thank you! I soaked the beans overnight, drained them and then boiled them. If you plan on cooking the chili for a full 8 hours in the crock pot, then you will not have to boil the beans. Just throw them in after soaking. LOL! I'm from Texas, and you NEVER put potatoes in anything you might call "chili!" We eat this quite often, only with chicken, navy beans, green chiles. Lol. My husband is from Texas as well! He put the potatoes in there because we had to use them up. They also helped thicken the chili. I'd like to add kale to this. Can I do that at the beginning of the slow cooker process or wait till the end? I would wait until it's almost done and then add the kale. Thanks so much for the delicious recipe! We were snowed in today and wanted something warm and slow cooked- this fit the bill perfectly. Unfortunately we didn't have a jalapeño but I made do with a green pepper and a dash of ground cayenne. Perfect! Can't wait to try it the "right" way next time. I made this the other day and the SO and I loved it!! I don't have a crockpot, so used my le creuset dutch oven which works perfectly. Let it simmer for an hour or so on the lowest flame. Mmmmm...! HI Melissa, What do you mean by "1/2 red pepper peeled?" Thanks! So I'm totally a novice here - are you saying a red bell pepper? Or some sort of red chili pepper? And once it's peeled, do you dice it? Or throw it in whole? It's a red bell pepper. :) Just peel, dice and throw in. How long do you think it will take for this to be cooked over gas stove? This may be a silly question but do you peel the fingerling potatoes? Everything looks delicious- but I cooked on high for 6 hours overnight, but this morning I found I have something that is definitely SOUP and not chili. I'm trying to cook with the top off now to see if it will evaporate the extra liquid, but I was wondering if you had any suggestions! You can remove the cover and turn up the heat to cook off some of the liquid. We are huge longtime fans of Melissa's and make her delicious recipes all the time! 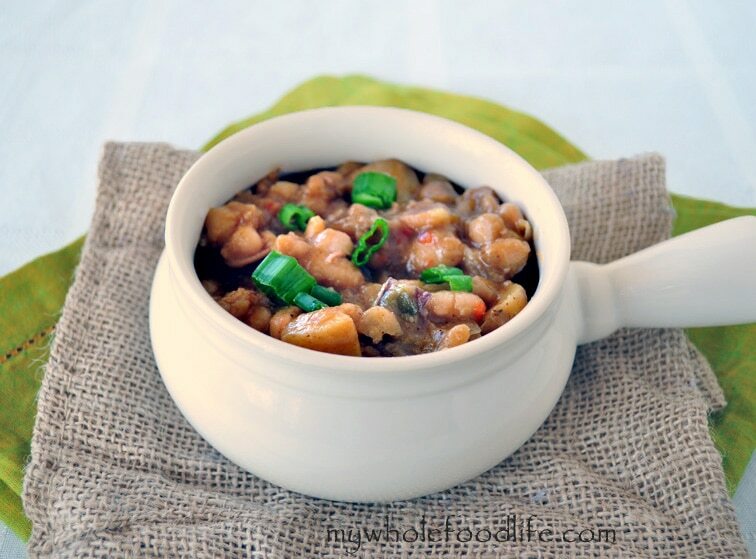 We finally made this white bean chili and loved it (just as we do everything she creates)! We did make one tweak and quite honestly we do this with most vegan soups in general. We took out 1.5 to 2 cups of the chili an hour before it was done cooking. We used the mighty Vitamix (I know, I know...technically we should have used an immersion blender for safety purposes) and puréed that amount and then added it back in to finish cooking. It really thickened the chili and made it super creamy. Also added a touch of sea salt to taste and we enjoyed our first cool autumn day with this delicious treat! If using canned beans, do you drain them? You are so welcome!! Enjoy it! Hi Melissa, 1. Do I need to soak 4 cups of dry beans overnight, or should it be a different amount in the dry stage? 2. I have "small white beans", northern beans" and "navy beans" - which ones would be best for this recipe? 3. Can this recipe be doubled? If yes, double all of the ingredients? - Thank you; I'm looking forward to trying this recipe. :) I have tried others; sweet potato chili, 3-bean, black bean and the hearty white bean and all of them were deeeelicious! Thank you, Melissa. I have an oval crock pot - is this what you would refer to as large? Also, which of the beans mentioned above would be best for this recipe? Thank you, Melissa. I am soaking the navy beans & I believe my crock pot is either 6 or 7 qt.